Three weeks ago, I wrote about a lawsuit filed by the ACLU and the Center for Constitutional Rights, based on the Treasury Department's failure to grant a "license" to those groups to represent U.S. citizen Anwar Awlaki in his efforts to obtain a court order barring the U.S. Government from assassinating him without due process. In response, Treasury officials issued the license (those groups are nonetheless proceeding with that lawsuit in an attempt to have the entire licensing scheme declared unconstitutional on the ground that the Federal Government has no authority to require its permission before American lawyers can represent American citizens, even if the citizen in question has been accused of being a Terrorist). With the license now issued, the ACLU and CCR this afternoon filed a lawsuit on behalf of Anwar Awlaki, with Awlaki's father as the named plaintiff, to prevent the Obama administration from proceeding with Awlaki's due-process-free assassination. Awlaki is unable to file the lawsuit on his own because the U.S. government's threats to kill him, as well as its prior unsuccessful attempts, cause him to be in hiding and thus make it infeasible for him to assert his legal rights directly. 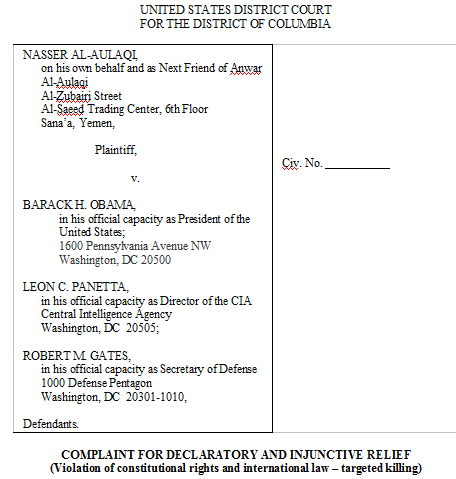 The lawsuit -- captioned Al-Aulaqi v. Obama -- was filed in federal court in the District of Columbia, and names Barack Obama, Leon Panetta and Robert Gates as defendants. 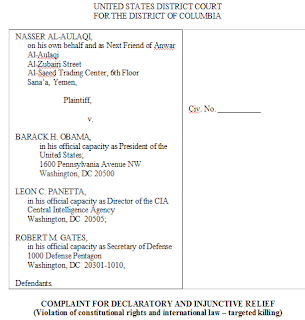 Among other relief, the Complaint asks the court to (a) "declare that the Constitution [along with 'treaty and customary international law'] prohibits Defendants from carrying out the targeted killing of U.S. citizens, including Plaintiff’s son, except in circumstances in which they present concrete, specific, and imminent threats to life or physical safety, and there are no means other than lethal force that could reasonably be employed to neutralize the threats"; (b) "enjoin Defendants from intentionally killing U.S. citizen Anwar Al-Aulaqi" unless they demonstrate the applicability of those narrow circumstances; and (c) "order Defendants to disclose the criteria that are used in determining whether the government will carry out the targeted killing of a U.S. citizen" (emphasis added). The right to life is the most fundamental of all rights protected by the Constitution and by international law. Outside the context of armed conflict, the intentional killing of a civilian without prior judicial process is unlawful except in the narrowest and most extraordinary circumstances. The United States is not at war with Yemen, or within it. Nonetheless, U.S. government officials have disclosed the government’s intention to kill U.S. citizen Anwar Al-Aulaqi, who is believed to be located there, without charge, trial, or conviction. . . .
Outside of armed conflict, both the Constitution and international law prohibit the use of lethal force against civilians except as a last resort to prevent concrete, specific, and imminent threats that are likely to cause death or serious physical injury. An extrajudicial killing policy under which individuals are added to "kill lists" after secret bureaucratic processes and remain on the lists even in the absence of any reason to believe that they pose a threat of imminent harm goes far beyond what the Constitution and international law permit. That the government has kept secret the standards under which it targets U.S. citizens for death independently violates the Constitution: U.S. citizens have a right to know what conduct may subject them to execution at the hands of their own government. Due process requires, at a minimum, that citizens be put on notice of what may cause them to be put to death by the state. It is "well settled that the Bill of Rights has extraterritorial application to the conduct abroad of federal agents directed against United States citizens." In re Terrorist Bombings of U.S. Embassies in E. Africa, 552 F.3d 157, 167 (2d Cir. 2008) (discussing the applicability of the Fourth Amendment to citizens abroad [emphasis added]); see also Reid v. Covert, 354 U.S. 1, 5-6 (1957) (plurality opinion) ("[W]e reject the idea that when the United States acts against citizens abroad it can do so free of the Bill of Rights. The United States is entirely a creature of the Constitution. Its power and authority have no other source. It can only act in accordance with all the limitations imposed by the Constitution. "); United States v. Verdugo-Urquidez, 494 U.S. 259, 270 (1990) ("[Reid v. Covert] decided that United States citizens stationed abroad could invoke the protection of the Fifth and Sixth Amendments"). What I've found most disturbing about this controversy from the start is how many Americans are willing to blindly believe the Government's accusations of Terrorism against their fellow citizens -- provided they're Muslims with foreign-sounding names -- without needing to see any evidence at all. All government officials have to do is anonymously leak to the media extremely vague accusations against someone without any evidence presented (Awlaki is involved in multiple plots!! ), and a substantial number of people will then immediately run around yelling: Kill that Terrorist!! It's an authoritarian scene out of some near-future dystopian novel, yet it's exactly what is happening. This is precisely the reaction of a substantial portion of the population which has been trained to believe every unproven government accusation of Terrorism. The mere utterance of the accusation -- Terrorist -- sends them into mindless, fear-driven submission, so extreme that they're willing even to endorse a Presidential-imposed death penalty on American citizens with no due process: about the most tyrannical power that can be imagined, literally. The fact that this very same Government is continuously and repeatedly wrong when it makes those accusations does not seem to be even a cause for hesitation among this faction. They just keep dutifully reciting the ultimate authoritarian anthem: if my Government says it, it must be true, and I don't need to see any evidence or indulge any of this bothersome process stuff -- trials and courts or whatever -- before punishment is meted out, including the death penalty. So now Barack Obama is being sued by an American citizen who is forced to plead with a court to protect him from due-process-free, state-sanctioned murder. There are multiple reasons why this lawsuit may not succeed, beginning with the demonstrated reluctance of federal judges to "interfere with" war-related decisions of the President, particularly when the specter of Terrorism is raised. The power-revering factions on the Right have joined with some Democratic loyalists who are comfortable with any power now that their Party controls the White House. But if the Obama administration succeeds in vesting itself with the power to order American citizens killed far from any battlefield, with no evidence of violent resistance to arrest and no due process whatsoever to contest the accusations, that is a power that will endure with future Presidents as well. The New York City cab driver who was stabbed in the throat last week for being Muslim, Ahmed Sharif, is unable to work due to his injuries and is struggling to be able to support his family. Those interested in donating to help him can do so here. It was an extreme outrage of the highest order -- a shredding of the Constitution -- when George Bush imprisoned or even just eavesdropped on American citizens without any due process. But it's perfectly acceptable -- even noble -- for Barack Obama to kill them without any due process.